The exact chain of events, what Moses' wrongdoing was, and a host of other details are unclear, and the story of Moses hitting the rock has baffled many a student for thousands of years. Let us recount the story, analyze the explanations of the classic commentators, and interpret the story with a chassidic spin. First, let's get some context. This was not the first time the Jews had no water. It is actually the third time the Torah records such a story.This was not the first time the Jews had no water. It is actually the third time the Torah records such a story. Moses and Aaron moved away from the assembly to the entrance of the Tent of Meeting, and they fell on their faces. [Then] the glory of the L‑rd appeared to them. The L‑rd spoke to Moses, saying: "Take the staff and assemble the congregation, you and your brother Aaron, and speak to the rock in their presence so that it will give forth its water. You shall bring forth water for them from the rock and give the congregation and their livestock to drink." Moses took the staff from before the L‑rd as He had commanded him. Moses and Aaron assembled the congregation in front of the rock, and he said to them, "Now listen, you rebels, can we draw water for you from this rock?" Moses raised his hand and struck the rock with his staff twice, when an abundance of water gushed forth, and the congregation and their livestock drank. This passage requires a lot of explanation. G‑d told Moses to speak to the rock, so why did He also tell him to take the staff? Also, what did Moses mean when he said, “Can we draw water for you from this rock"? The Jews had watched him bring water from a rock for 40 years, and G‑d had just commanded him to do precisely that. Why the hesitation? Additionally, why did Moses call the Jews “rebels,” and why did he hit the rock twice? The classic commentator Rashi fills in some important background information: G‑d told Moses to speak to the rock, but the rock had rolled away and rested among other rocks. Moses didn’t know to which rock he should speak, and the one he addressed was the wrong one. Nothing happened, and the Jewish people began to mock Moses, demanding that he draw water from any rock. Moses grew angry and called them rebels for insinuating that he had the power to perform a miracle where G‑d had not willed it (i.e., with a rock other than the one G‑d had specified). The L‑rd said to Moses and Aaron, "Since you did not have faith in Me to sanctify Me in the eyes of the children of Israel, therefore you shall not bring this assembly to the Land which I have given them. These are the waters of dispute [Mei Meribah] where the children of Israel contended with the L‑rd, and He was sanctified through them. In an instant, Moses and Aaron’s dreams were crushed. Their life’s goal, to bring the Jews to the Promised Land, dissolved to dust. Why? Of what sin were they guilty? And why such a harsh punishment? In the thousands of years that the Torah has been studied, tens, if not hundreds, of interpretations have been offered on this story. We will focus on seven major interpretations, one less literal analysis, and one chassidic explanation. As mentioned above, Rashi’s commonly accepted explanation is that Moses hit the rock when G‑d instructed him to speak to it. G‑d specifically wanted him to speak to the rock so the Jewish people would realize that if even an inanimate rock listens to the word of G‑d, how much more so should they. They would have been so inspired, they would never have sinned again. Moses disobeyed G‑d and hit the rock, and an opportunity to glorify G‑d was missed. Therefore he and Aaron were punished. Nachmanides supports his explanation with G‑d’s opening words to Moses, “Because you did not believe in Me,” implying that this was a failure of faith rather than a lapse of obedience or a surrender to anger. The fifteenth century commentator Isaac Abarbanel takes issue with all these explanations, pointing out the flaws in each one. One of his primary concerns is that whichever way one learns the story, Moses and Aaron’s sin was not enough to warrant them being barred entry into the Land. He therefore takes a unique approach, saying that Moses and Aaron’s sin was not particularly terrible; they merely made a mistake. However, G‑d did not want them entering the Land for other reasons. Moses, because he sent the spies, and Aaron because of his involvement, albeit unwilling, with the sin of the Golden Calf. G‑d wanted to protect Moses and Aarons’ honour, so He pretended that the rock was the reason for their punishment, to cover up the true reason. Rabbi Joseph Rosen, the Rogatchover Gaon (Genius) provides a fascinating alternative explanation, which requires the following preface. In addition to drinking, the Jews needed the water of the well to serve as a mikveh, a ritual immersion pool. The laws of niddah, ritual purity, dictate that, once a month, a woman must separate from her husband for a period of time. Afterwards, she immerses in a mikveh, and only then is the couple permitted to be together. One of the many laws of mikveh states that when drawing water from a stream or well to a mikveh, any tool that is susceptible to becoming impure may not be used. Only vessels that could never become impure (e.g. stone) may be used in directing the water flow. Otherwise the mikveh is invalid. The Rogatchover Gaon explains that Moses’ sin was that he took the wrong stick. G‑d wanted him to hit the rock with his own stick, but in his humility, Moses thought G‑d meant Aaron’s stick. Whereas Moses stick was made of precious stone,15 Aaron's was wood. Wood is susceptible to becoming impure, and so when Moses hit the rock with Aaron’s stick, the water that flowed from the rock was not kosher for a mikveh. Notwithstanding all the above-mentioned explanations, one thing remains unclear. Why did Moses, the greatest prophet and tzaddik, disobey G‑d? Obviously, such a man would not sin out of spite or rebellion. Tikunei Zohar states, “The rock represents Torah. Had Moses (spoken and) not hit the rock, the Jews would not have to toil in the study of Torah.17 Moses’ hitting the rock caused the Torah to descend from its place of purity and exaltedness, and descend into the falsehood of this world.” Striking the rock caused the Torah’s light to become concealed, making it difficult to connect with G‑d. 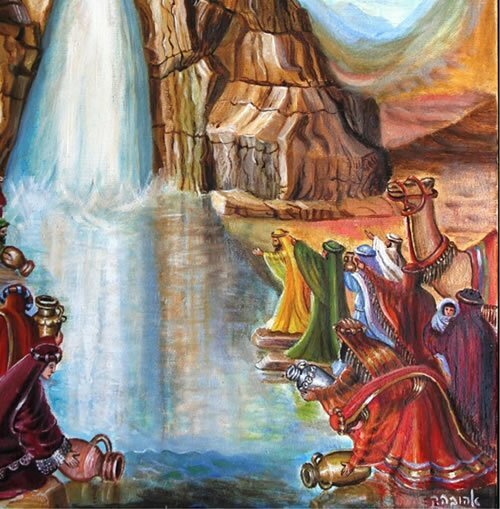 Had Moses spoken to the rock, as he was commanded, the waters of Torah would come out freely and flowing. One would not need to toil and struggle to understand the Torah, for its light would shine openly and simply. Had Moses spoken to the rock, the Jews would see G‑dliness openly, and connect with G‑d easily. Moses struck the rock because he recognized that only if Jews toiled would their connection to G‑d and his Torah be real. Nevertheless, Moses struck the rock because he recognized that only if Jews toiled would their connection to G‑d and his Torah be real. If everything were to come easy, there there would never be a genuine connection; the Jews would never break out of their comfort zones to connect with G‑d, and they would never become truly one. G‑d, the Jews’ loving father, wanted Moses to speak to the rock, wanted Torah and G‑d to be easily accessible. Nevertheless, Moses, whose entire existence was about connecting Jews with G‑d, knew that we must toil to connect, and thus he struck the rock. Based on this explanation, perhaps we can understand why Moses and Aaron had to die before they could enter the Land of Israel. This was not as a punishment, heaven forbid, but rather the first step in the fulfillment of Moses’ goal. Moses and Aaron represented pure G‑dly revelation; their very existence revealed G‑dliness and inspired people to serve Him. Living in their presence made it easy to connect with G‑d. Therefore, Moses and Aaron could not enter the Land, so that their own plan to create a strong bond between G‑d and the Jewish people could come to fruition. Bearing this in mind, it is understood that Moses’ sin was not as a rebellion against G‑d; it wasn't even a mistake. Moses’ sin against G‑d was for G‑d’s sake. Moses did not listen to G‑d because he knew that were he to disobey Him, in the long run the unity between Jews and G‑d would be more real. Ultimately, G‑d would be glorified and served in an infinitely greater manner. In striking the rock, Moses made a conscious decision that, for the sake of genuine connection, he must disobey G‑d. Likkutei Sichot, vol. 28, pp. 124-131. Shemonah Perakim, end of ch. 4. Yalkut Shimoni, Chukat, Remez 763-764. See Ohr Hachayim, Numbers 20:8, for a lengthy explanation. Sefer Ha’ikrim, Maamar 4, ch. 22. Responsa, Tzafnat Panei’ach 119:7; Tzafnat Panei’ach, Chukat 20. This explanation posits that the stick Moses was supposed to take was his own. See Chizkuni and Kli Yakar for alternative opinions. Tikkunei Zohar, Tikkun 21, p. 53:b.
I loved this article! So much interesting information all set forth so easily and relatively short. The Rogechover blows my mind, what a genius! Really appreciated the in-depth study of this enigmatic incident. Would love to see more material of this nature. don't run around beating up on rocks because you think you are so superior. We are also part rock, and rock is the physical foundation here. R. Refson in Leeds says that rocks have souls, too, the soul of the inanimate, the life force that keeps it in existence as authored and sustained by HaShem. We are all connected and part of one another. Rocks included.